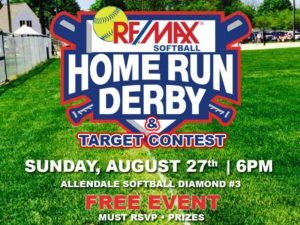 1st annual home run derby and target contest this August 27th 6pm! This contest is for Allendale softball league players only. Top Prizes will be brand new softball bats! Home Run Derby | Each Participant will get 20 Pitches and then the top 3 hitters move to the finals which is a 10 out format. Also visit our Facebook event to stay current on details and ask questions! Return to this page often to set updates!